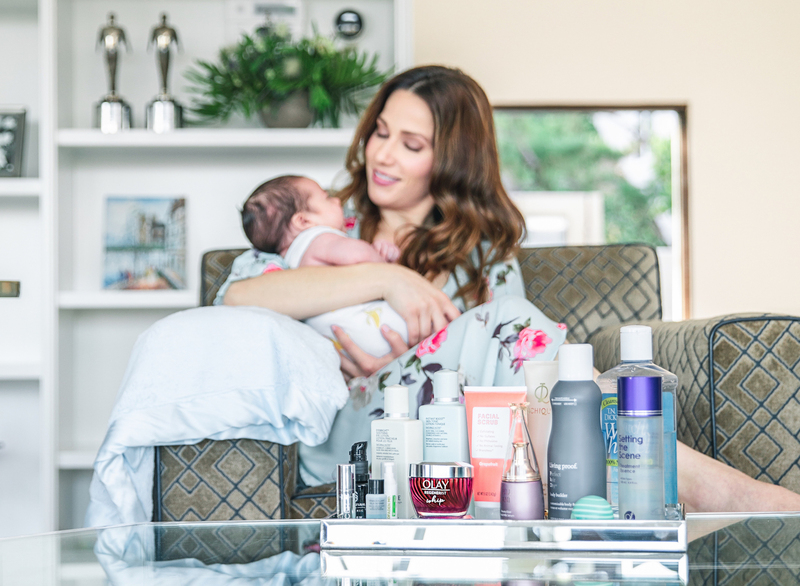 As a new mom to an eight-week-old baby, I barely have time to shower let alone indulge in a lengthy skin care routine. Between post-birth hormonal imbalance and lack of sleep, my postpartum skin needs more attention than ever! And let’s keep it real, I’m a woman in my mid-thirties who is trying hard to age gracefully, so of course, I’m interested in reducing the appearance of fine lines and wrinkles. 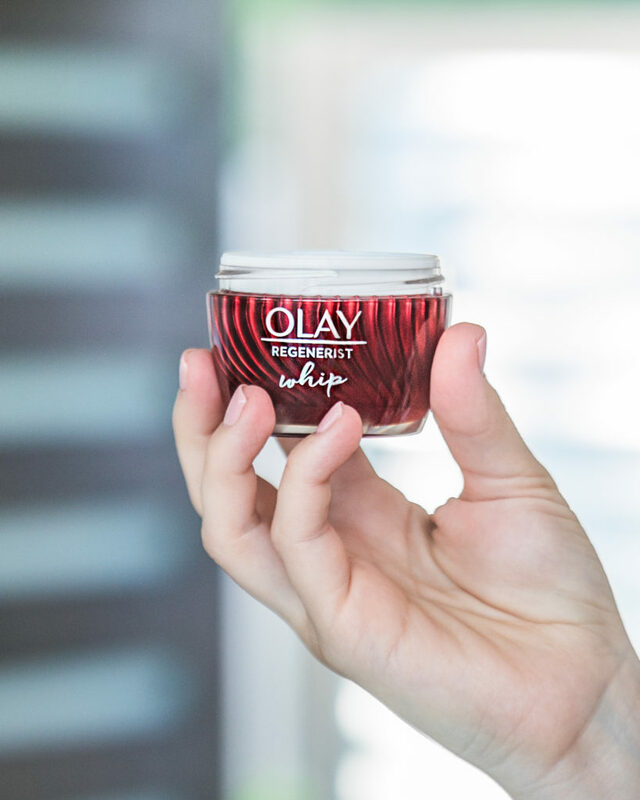 I need products that can do a multitude of things, so I’m so thrilled to partner with Olay Whips to share my quick skincare routine for busy moms. 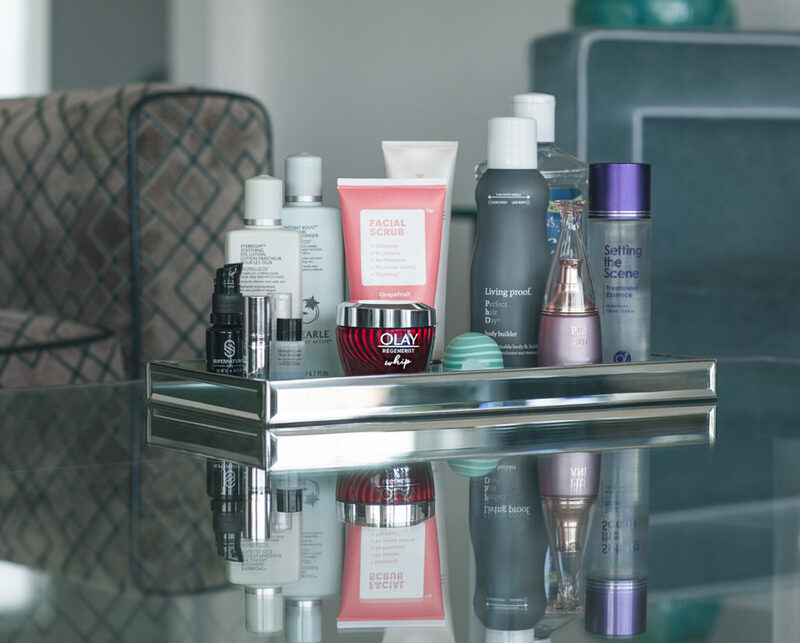 Whether you are rocking that #nomakeup look or have your best glam on for a night out, skincare is truly the most important foundation for a flawless look. You must absolutely wash your face on a daily basis and exfoliate a few times a week. But the most important component in my skincare routine is a fabulous moisturizer! I’ve been using Olay Regenerist Whip with SPF 25 because it brings a seriously powerful hydration that absorbs super quick and is extremely breathable. Usually, when I use a moisturizer that really quenches my skin, it feels sticky and tacky underneath my makeup. 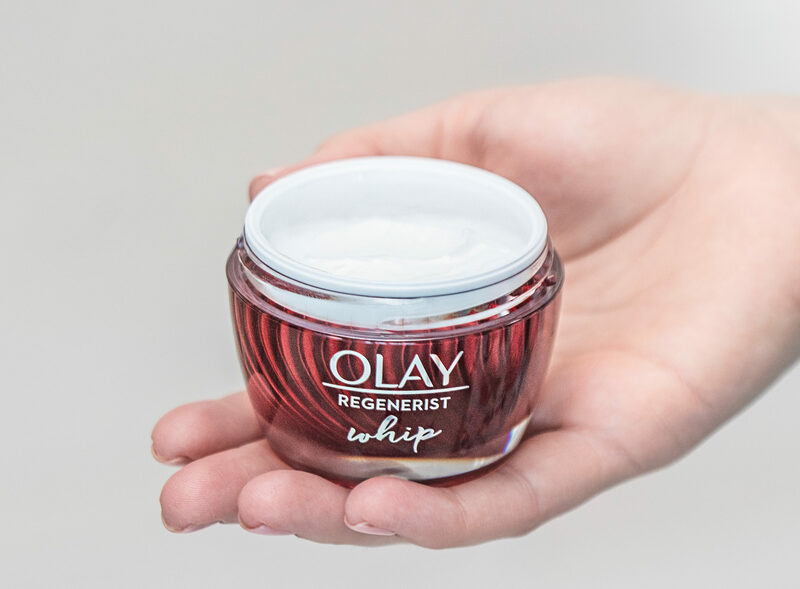 But Olay Regenerist Whip is made with an Active Rush Technology that transforms from cream to liquid on skin for instant absorption and a smooth matte finish! 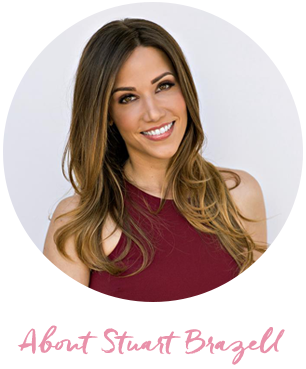 As a busy mom, when you actually find time to put makeup on, you want that makeup to stay in place! A reliable primer is the key to keeping your makeup looking fresh all day long and well into night. Olay Whips must seriously be the unicorn of moisturizers because it is a lightweight moisturizer AND a primer in one! Having a product that multitasks just like you do is a total game changer in trimming down the time in your skincare routine. And no need to stress about touchups because you can say goodbye to that 3 pm shine! Every moment you can sneak in that special ‘me time’ is EVERYTHING. You will even look like you actually had time to freshen up when you head out on the town for a fun and so deserved Girls Night Out! Us busy moms are totally sleep deprived, so we are climbing a serious uphill battle when it comes to fighting and hiding wrinkles. Luckily Olay Regenerist Whip diminishes the look of fine lines and wrinkles. Plus it actively hydrates to improve elasticity and firm skin for a lifted (hey you could have gotten 8 hours of sleep) look! It is also formulated with advanced Amino-Peptide Complex II to regenerate surface cells. Hey, we may not have time to get a facial but at least we can look we did! No matter what age you are, skincare is essential. Be sure to drink plenty of water all day long and use a toner before you moisturize in the evening. I hope you have enjoyed my quick skincare routine for busy moms. As we wrap up summer and head into fall, we will be busier than ever with back to school and the holidays. Olay Whips is the perfect product to have in your personal arsenal to deliver powerful skincare with a dewy, but not shiny finish. No longer do we have to choose between a product that provides powerful results, but feels sticky and tacky, or one that feels truly lightweight, but doesn’t offer much beyond basic hydration. Olay Whips work and feel different than anything else I’ve used before. Hey, us unicorns deserve unicorn products right :)! Olay skin care products have always been a line I can count on to do exactly what they advertise. 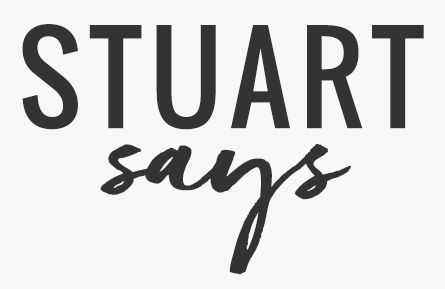 I love their products and enjoyed this article! Thanks so much!! Yay for Olay! Olay has the best products. And you look absolutely amazing. I’ve used Olay products in the past, but I haven’t heard of the Olay Whips. It sounds wonderful! I need something for my dry skin this winter. Sometimes some little quick skincare routine can make a big difference. Your instruction is very helpful. Thanks for sharing! I’m always looking for new skincare products to try, this is great, thanks! I’ve heard a lot about this stuff, I’ll have to try it out! Olay is really a great line of skincare product. In fact, I have been using their product since then and it has a really great effect on my skin. Your skin looks amazing. I could just squeeze baby too. Olay really takes great care of your skin. You look so radiant. This would really be a great gift for new moms. I love olay skin care products. Olay Whips sounds awesome. Yes, we all busy mother need a good skin care product. You look great. This moisturizer is so amazing. I just tried it last week! I’m not a huge fan of Olay products, but I do appreciate your tips. Thanks for sharing!